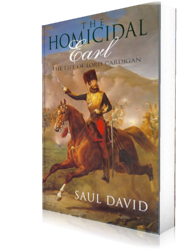 The 7th Earl of Cardigan, the subject of this biography, is always remembered as the man who led the infamous Charge of the Light Brigade at Balaclava in 1854. A fatal event for so many of his men, it was to rejuvenate Cardigan's life. Hitherto his career had been dogged by public scandal and professional disgrace: a failed marriage to a divorcee, two court appearances for adultery, two courts martial, numerous duels (which earned him the sobriquet "the homicidal earl"), a state trial for intent to murder, dismissal from the command of a crack cavalry regiment, being blackballed 46 times by the leading military club, being hissed at in theatres, parliamentary questions about his conduct. All seemed conveniently forgotten in the wake of his valour at Balaclava. But was Cardigan a hero? Or was the fierce criticism of his conduct in the Crimea by fellow officers - that he ill-treated horses and men and, even worse, saved his own skin at Balaclava - justified, and in keeping with his reprehensible past? Against the backdrop of a country in the throws of social, political and economic revolution, the book depicts Lord Cardigan as a man both of and outside his times. Better than Simon Schama, Saul David has re-cast history as addictive narrative… This dazzling portrait of an unpalatable figure is not to be missed. Scintillating… Saul David, still only in his thirties, is obviously a rising star. His marvelously lucid, and sometimes very witty, narrative is based on sound archival research and written with great stylishness and verve. It is a book almost better than the heroic old reprobate deserves.